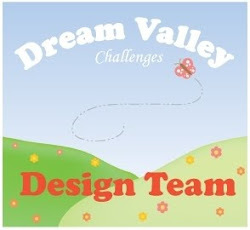 Come over to the Dream Valley challenge and join us for our latest challenge! Our sponsor this time is All Dressed Up. Brads come in all shapes and sizes these days and on this card I’ve used two. One of them is the dragonfly and the other I’ve used in the centre of the flower. The doily on the other hand was one I cut from the built in patterns on my scan n cut machine along with the two swirls at the top left on the card and the mats. The image was coloured with Chameleon pens and the card blank is one I cut from Kit and Caboodle. Come over to the Dream Valley challenge and join us for our latest challenge! The sponsor this time is LeAnn’s World 101. For this challenge I used the digi stamp from our sponsor and also some clear Creative expressions stamps from this set as I felt they went well with the image. I used my Chameleon pens to colour the image and then the stamps too so that the project was coordinated. I added this text stamp from the set on the inside of the card. I haven’t used my Chameleon pens in a while so quite enjoyed blending them here.